“It’s about passion. It’s about New York. “New York is the place where you go about your dreams, and if you stay there, it’s to make them happen,” says the warm and excited namesake of the Richard Taittinger Gallery. 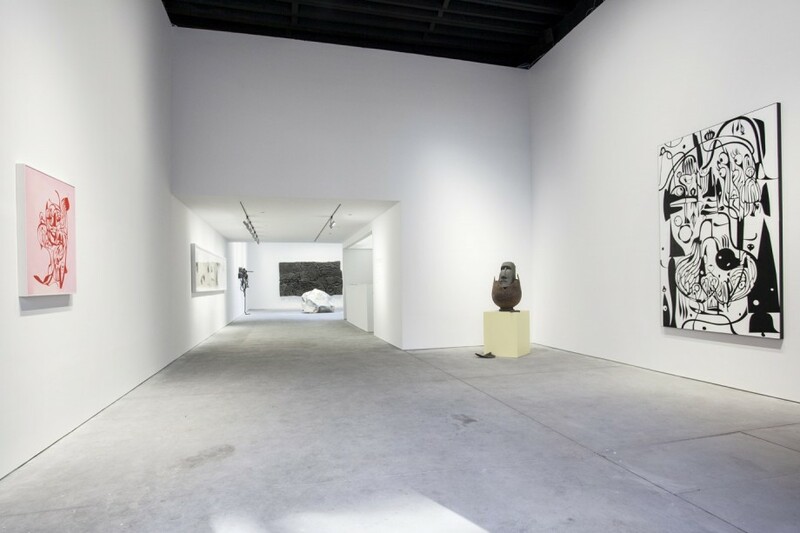 “It’s the result of a long, long process,” and nestled into the busily growing Lower East Side of Manhattan it is the latest gallery in a string of openings. Structured with a positive ethos of foundation building, Taittinger seeks to provide a platform for contemporary artists to challenge the status quo and bring about new ideas.. Like many of the galleries in the LES, the atmosphere is open to the expeditiously shifting grounds of Now, refusing to be tied by traditional bounds. It nurtures the oblong, the obtuse and acute angles that seem to be the shared aesthetic in the excursions of work being created by a young at heart group of artists, no matter what age they may be. Taittinger strives to create an air of innovation with his gallery acting as the pro tempore initiating ground for ideas fit to address the rapidly developing and ever-evolving socio and psychological landscapes of 21st Century. It was the end of the 20th Century however, when Art struck early on a love affair with Richard who, growing up in Paris would use his time after school to wander through the halls of Hotel Duorot “..this magical, very old auction house where you can find beautiful things, horrible things.. ” The magic captivated him with the exemplars of the human mind and spirit, his love burgeoned in the radiance of this backdrop, this canvas of tycoons walking in suits discussing grand paintings quietly with art advisors.. the auctioneers and staff bustling around the fine antiquities. “I was not supposed to go that way, because of family roots in Champagne.” So he didn’t, at first. But at 27, he thought, “Now, let’s go. Let’s focus on your passion, your true passion, which is Contemporary Art.” Contemporary Art is the Voice of the Moment. It is the writing of tomorrow’s history, today. “To pay tribute to the artist” is the why behind Taittinger’s gallery. “There are great Artists from every time, the great Impressionist Artists were great Contemporary Artists for their time because they were trying to do something different. They were trying to push the boundaries.. and that’s what we’re trying to do here too.. Artists are messengers. Artists are our guides. Artists help us to understand our time.” That is why Contemporary Art is so important, because gives (or is meant to give) cathartic enlightenment to the people. It is meant to bring about conviction and direction. It is meant to inspire, it is meant to take the breath away with its sincerity and poignancy of the moment. “There is the object, the attraction of the beautiful things, yes, but it is much more than that,” continues Taittinger, “With Contemporary Art, as a gallerist you are such a lucky person because you can meet the [artist], and create the link, and that is fantastic.” Connecting the people with issues, ideas and concerns which must be addressed is a great honor and responsibility, one that now at 34, Mr. Taittinger has taken on in opening his own gallery with much care and attention to the process of experience Contemporary Art has to offer. For his opening exhibition, Taittinger chose a group show so to be diplomatic as well as dynamic. Not giving preference to a single Artist on his roster at the Grand Opening declares a pledge of loyalty to each Artists’ individual principles and is a crucial aspect in his overall vision of a solid launching pad into New York, the central pulse of culture. He has drawn together artists from around the world that each bring a strong and unique perspective, informed by their life experience and geographical upbringing. (All of his current artists have impressive, globe spanning credentials. See their full CV’s at richardtaittinger.com/artists) “What you see here is more than a commercial space, it is a platform to exchange ideas, concept.. and I am glad to be a part of the Board of Directors of Residency Unlimited, a non profit organization to invite creators and artists from around the world to come to New York City.” This increases the wealth and vigor of the locale by infusing the environment with foreign perspective, adding an adjacent angle that provides a broader scope of vision, and merging diverse outlooks to put together a more complete image of our time. This creates a cultural center where ideas flow like rushing rapids, urging every drop and every stream to join the river on its way to the ocean of knowledge. Richard points to the other cities that have been the cosmopolitan capitals for their time, drawing the greatest minds and creators of the day, London, Paris, Constantinople you can add Baghdad, Damascus, Alexandria, Xi’an, Athens, and of course, countless more, when you look at the beauty, majesty and truth that came from their Contemporary Artists, one can recognize the importance of Contemporary Art. The main difference I would say between the great artists of antiquity and the great artists of our time is the focus of their production, and the use that it goes on to fulfill. The technological age has gone to impact so severely the human attention span, and the industrial revolution has brought about such extreme excess that our Contemporary Art seems to say less about the Human Endeavor and more about the Personal Pursuit for Profit. That which is shown in a gallery is a statement of what is imperative to the time, those things weighing on the hearts and minds of its constituents. That which a society deems important is that which goes to inform Humanity of its present level of self-awareness. What with all of the avenues to explore in the world today, global economic imbalance, technology racing at break neck speed – pulling away from the natural psychological evolution of the human being creating a vast rift of uncharted territory, mass incarceration and widespread corruption, as well as the astronomical advances in physics detailing for us the spiritual makeup of all matter, there is no shortage of material to decipher as our own contribution to human history. Our modern problems are not so different from the problems of the past, but they certainly have arrived with a fresh odyssey of empirical examinations to be had by those whose hearts yearn for the freedom of understanding, for those that seek to find the beauty and glory hidden in all things. Richard Taittinger opened his gallery to champion Contemporary Artists. He opened his gallery to connect the public with their time and he came to New York because it is “the only place where it’s possible to really start from scratch.” He chose the Lower East Side because of the unique spirit that has steadily been taking shape as a place where Art is King. He believes in building a strong community of artists and galleries that will engage the minds and spirits of many, creating new channels of thought and new aspirations of hope. “Yes, I’m a dealer, but before that my dream is to be a gallerist, and [to be] a gallerist is to have a vision, it’s more than just to sell for a living.” The candor with which he speaks is endearing, and his intention honorable. His vision is taking shape at 154 Ludlow Street, and in the beginning phases of its journey is showing good face for the changing tides of the Lower East Side and the New York Art Scene. Here’s to the New Stage of Art!